A powerful group of people on Saturday assembled on the shore of the Baltic Sea, near the city of St. Petersburg for the name ceremony of Russia’s first ice-breaking LNG carrier. In addition to the president, three government ministers, speaker of the Federation Council Valentina Matvienko and Novatek owner Leonid Mikhelson had made their way out of the conference rooms of the ongoing St.Petersburg Economic Forum to the local sea port of Bronka. There she was, the ship that can break through 2,1 meter thick ice with up to 172,600 cubic meters of liquified gas on board. The «Christophe the Margerie» is the first of 15 ships of the kind made to transport LNG from the remote Yamal LNG project. The carrier, built at the Daewoo Shipbuilding Marine Engineering (DSME) in Korea, sailed to St. Petersburg after weeks of testing in Arctic waters. «The «Christophe the Margerie» is the most modern ice-class tanker and will become flagship in a fleet of 15 similar vessels, all of them assigned for the grand Yamal LNG project which we are developing together with French and Chinese partners», Putin said in the ceremony, a press release from the Kremlin reads. «We expect new perspective and huge projects to be launched in the resource-rich Arctic, some of them in cooperation with our French, Chinese and other foreign partners», the President added. The «Christophe the Margerie» is the world’s first LNG carrier with ice-class Arc7. The shipping company says that the LNG tanker has the engine power of 45 MW, which is «comparable with a nuclear powered icebreaker». The new ship is named after the CEO of French company Total, who died in a plane accident in Moscow in 2014. On 10th February, the ship entered into the Russian part of the Barents Sea and subsequently set course for the northern Parts of the Kara Sea. During its voyage, the tanker criss-crossed through the region and also made it into the Laptev Sea. 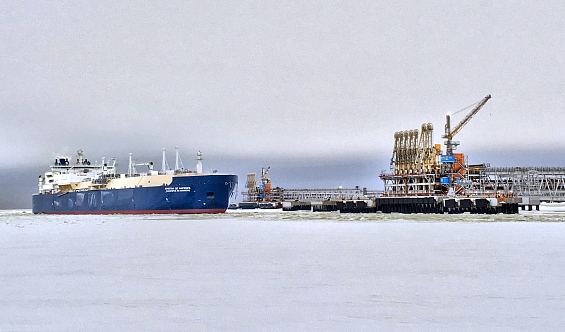 On 28th March, the «Christophe de Margerie» entered Sabetta, the sea port made in connection with the Yamal LNG.